With Life hanging in the balance, the Walk for Life is your opportunity to fight back! Abortion advocates are emboldened in their war on the unborn and continue to fight to push their sexual chaos in our schools and culture. We depend on your help to be able to fight for women and babies. Join us as we "Walk for Life" on Saturday, May 11 at 9:00 a.m. 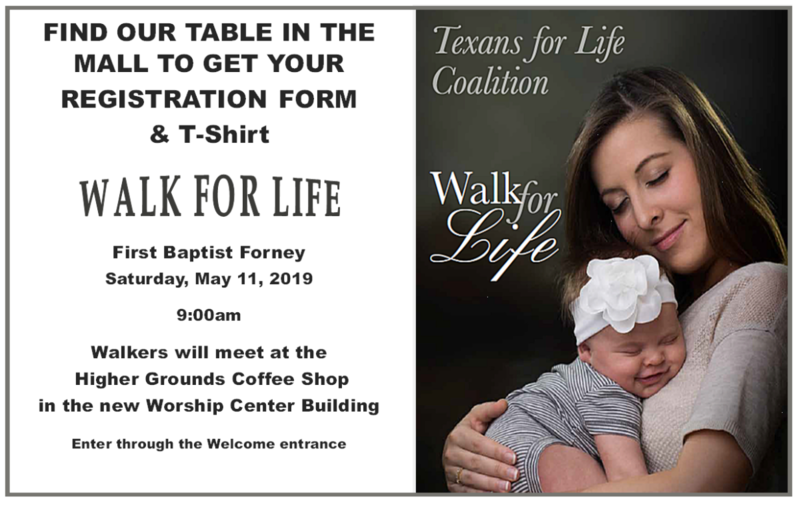 Pick up a registration packet at the Walk for Life table in the Mall of the new Worship Center. Meet that morning at the Higher Grounds Coffee Shop. Contact Kirk at with any questions.